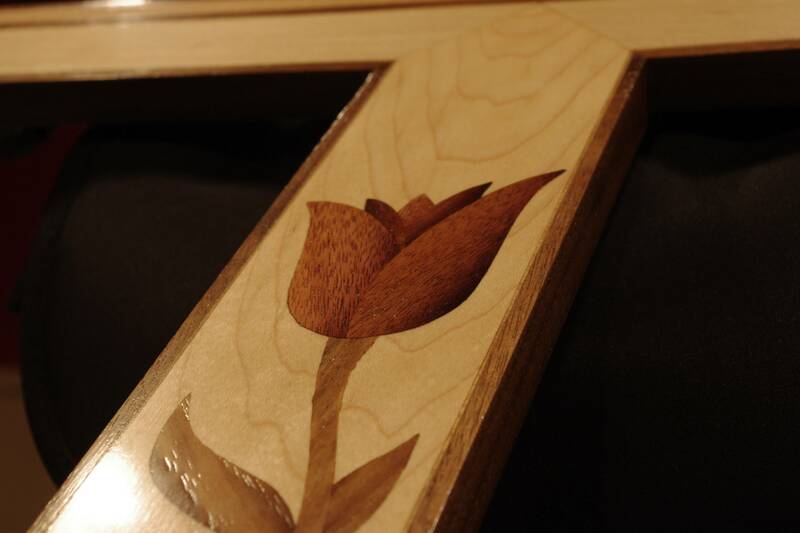 Inlay is a great way to adorn your woodworking projects. Even the simplest item can become incredibly compelling if it features a well-executed inlay. With the right materials and techniques, its just like painting with wood. Only “non-artistic” folks like myself can actually do it! The video covers all of the details, but here are the basic steps. You may also want to check out my inlay pictorial. – To make an inlay, you’ll need thin pieces of wood veneer, a router, a few small router bits (see Products Used), a magnifying headset, carbon paper, and an x-acto knife. – Draw your image on a piece of tracing paper and use the carbon paper to transfer the image to your substrate. 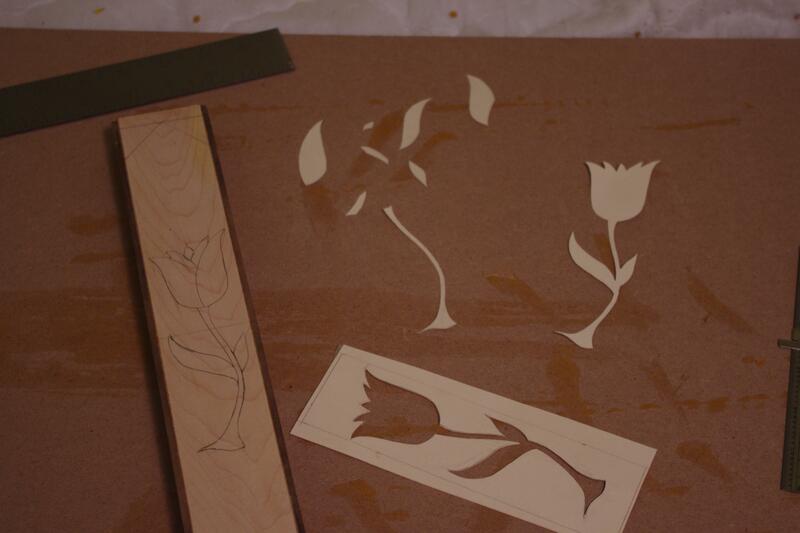 – Use the carbon paper and tracing again to transfer the various shapes to your desired pieces of inlay veneer. Use a bandsaw, scroll saw, or fret saw to cut them out. – Inlay one piece at a time. Double stick tape the inlay piece to the substrate in the appropriate position and trace around the perimeter with an exacto knife. – Once you have a nice deep scribe line, carefully remove the inlay piece. – Begin routing with 1/8″ bit, staying away from your scribe lines for now. 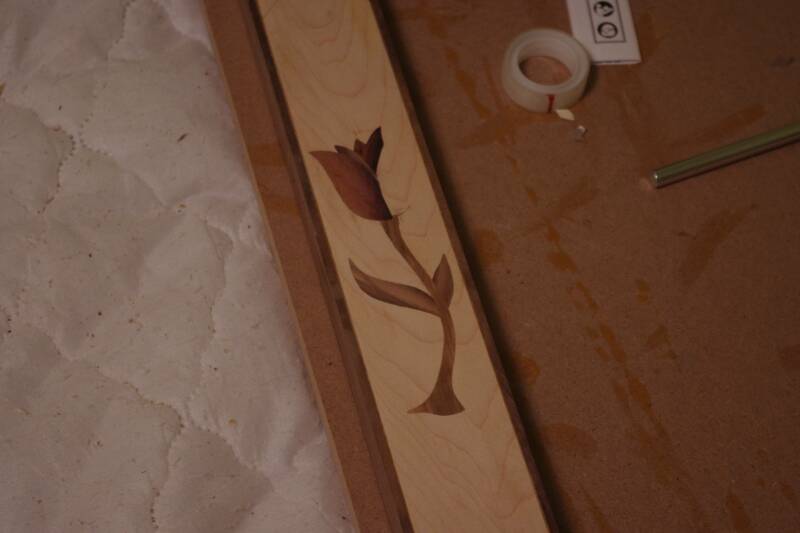 The depth should be set so that your inlay pieces will sit just slightly proud of the surface. – Switch to your 1/16″ bit and use your magnifying headset to sneak right up to the line. Watch for the wood to fray and break away at the point when you’ve reached the scribe line. – Test fit the inlay piece and remove material where required. Also consider sanding a slight bevel into the inlay piece so that it fits somewhat like a cork in a bottle. – Add glue to the recess and the veneer piece and clamp down for 4-6 hours. – Once the glue is dry, use a scraper or block plane to remove the excess stock and then repeat the process with the remaining inlay pieces. By the way, I learned this technique from David Marks. If you are in the N. California are, be sure to take one of David Marks’ marquetry and inlay classes. You want to have a picture of something on your computer monitor? Use the button on the keyboard. This will put the image into the clipboard. Then open Paint, or what ever image software you choice, and paste. Then you can edit it or print it, even in color. I’ve been doing this for years. It’s easy, fast, and you can send it because it is digital. Which button on the keyboard? I think he is talking about the Print Screen button. Or Cmd-Shift-4-Drag on the Mac. the screen grab application that comes with mac will let you print any part of the screen you want! Marc, Enjoyed the tutorial. I used a variation of the design for my latest project. I did give you the credit in the video, https://www.youtube.com/watch?v=MUHa0_t9j4s. PS, our website is down for maintenance. Way to take it to the next level Marc. You made a really simple project just “pop”! Great video quality as always. Thank you for showing us some of your learning mistakes on your earlier projects. It gives us newbs hope. P.S. I don’t know if I have the guts to do that to my Shaker Top. We shall see…. Yo whats up marc that was a good video. I have a 1/8 straight bit so I was thinking if I was to try a router inlay on an end table table top would it be better to free hand with the 1/8 in straight bit. Or use a template. Well as you can see, I prefer free-hand over template kits. But the templates certainly do have their place for geometric shapes. Hello Marc,great video.3o minutes for free,simple states the commitment you have to your fans.Have thought of using more of the magnifying glasses instead of the head gear style?I don’t think that they are safety rated but being closer to the eyes might offer more protection.Love the spaceballs reference,dark helmet wood approve.They inlay looks great.Keep up the hard work. Thanks for sharing this technique. The little tips about the order of inlay and filling gaps are not something you always find in other sources. 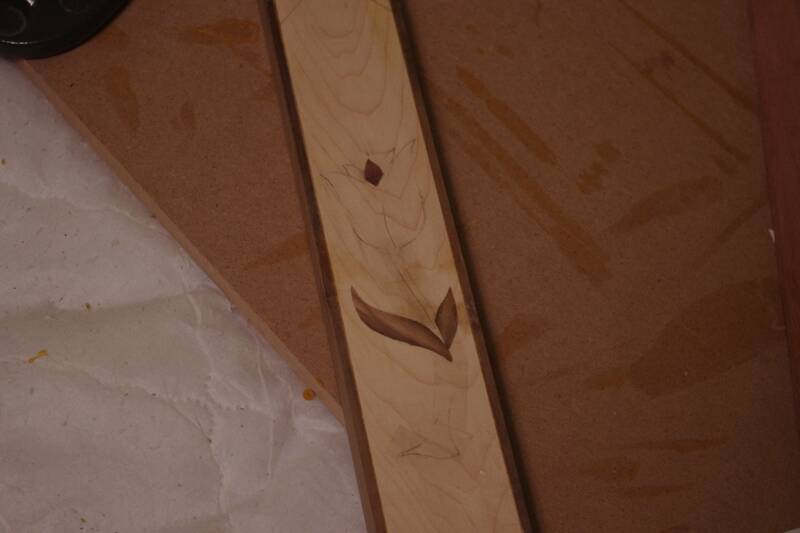 Also following along the entire inlay from planing to finish really helps to put the pieces and process together. Best 30 minutes I’ve spent at my office desk in a long time. I’m so glad you didn’t go to plaid by the end of this fabulous video. not only did you get the instruction on how to do inlay (for those of us -like myself- who haven’t attempted it yet), you also gave us the tip on sand shading. You mentioned rounding the lines of the edges. My local leather guru, the manager of my local Tandy Leather retail store, mentions quite frequently that there are no straight lines in nature. It’s okay to have lines that do not appear precise. as far as template work goes, can you use similar techniques to apply this to a plain plexiglass sheet, and then use bushings or guide bearings to apply this to your table top? Excellent video Marc! I’ve been interested in how inlays are done for a while. How would you cut out the areas by hand? A tiny cute chisel, I assume. Also, to remove the pieces that you taped you could use a heat gun (or Nicole’s hair dryer) to heat the piece a bit. This will loosen the tape’s grip allowing you to remove it more easily. Oh, and the shirt doesn’t look nearly as bad as you made it sound on Twitter. Awesome addition to the Guild Build! Also really cool of you to do so much for free…..Everyone, just think, if this is what you get for free, imagine what us guild members are getting??? Marc, this was an absolutely fantastic video. Being a Guild Member I am envious of your non members that they have been given this gift. If this does not bring you more Guild Members I don’t know what will. Kudos Marc, kudos! Wow, that sand shading really added a lot to the finished inlay. For affixing the individual pieces to the substrate to score them with the exacto knife, I really like to use spray adhesive. It’s very quick drying, thin, and best of all, it’s easily reversible by just pouring a tiny bit of mineral spirits onto the wood when you’re finished scoring/scribing the outline—the piece almost falls right off. Since switching to the spray adhesive, I’ve yet to break a piece when trying to pry it off of the wood surface. The routing technique seems a bit different from what you used on the G&G frame – there, IIRC, you were ‘feeling’ for the groove. Also, when you glued the leaves down it appeared you had wet the recess (it was a different color from the surface) – but you never mention it. Did you dampen it? And if so, why? Hey Derek. In the frame video, I wasn’t actually routing to the line. I left it deliberately oversized so I could clean it up with a chisel. Awesome job Marc. Your vids are informative and professional as well as entertaining. I eagerly await each one you produce. Please, keep it up. .I am about to try turquoise and garnet inlay. A lot easier in a sense, because you don’t really have to cut the turquoise precisely, you’re just filling it in with pieces and ca glue. The hardest part I’ve found so far is making those cuts and I think the key ingredient I’m lacking is patience. I’m glad you reminded me! Nice, I’ve done marquetry but never inlay. I appreciate your video. When you where tapering your piece to fit, could you not have just dried it out a little to shrink it? That way when it expands back, it might fill any gaps that might have been there like in your stem. Or would it try a pop out later? You can, but the shrinking is a little unpredictable and not necessarily even across the whole piece. Remember that the wood is going to shrink the most across the grain. So its taking a bit of a gamble to count on the shrinkage. So I prefer to make it fit almost perfectly, where its just a hair too tight, then sand shade, then return the moisture to the piece if need be. I just don’t like counting on the shrinking in any way because I don’t really trust it. I agree with the others that your mushroom isn’t as bad as you made it out to be on Twitter. And I wish I had ludicrous speed in my shop; my speed is like rolling… uphill. Great post. That makes me want to go do some inlay. Its been years since I’ve done anything similar. The sand technique was great. The first being that the inlay is awesome and I have witnessed a lot of it in your podcast videos. The inlay addes a unique beauty that is man established, while the wood grain is nature established. Secondly I agree with the negative impact that may happen to Man’s Best Friend (the dog). While my dog is too old at this time, there was a time when the dog would get excited for whatever reason and he would jump up on me. I would hate to think that the dog may jump on me when I was using the cabinet saw or any sharp instrument. Please keep up the great work Marc. Another great video and it inspires me to try something new. I have heard some people using a dremel tool rather than a plunge router. What do you think is the way to go? Also, why did you do the leaf in 2 parts? Keep up the great work. Hey Chris. I actually addressed the Dremel question in the video. And the leaf has to be done in two parts in order to make the grain run in the proper direction. It gives it a more natural look. Mad skills, just plain mad I tell you. Very well done!! I truly enjoy your entire web site, you bring things down from the lofty out of reach stratosphere that a lot of master woodworkers portray the art in and bring it within reach of us commoners:) Thank you for a great site and videos!!!! Awesome video mark! You had me laughing out loud (seriously), at the space balls reference! I was laughing out loud when I saw “Ludicrous Speed” too. Another great video Marc. Inlay looks very time consuming and to film the steps in the quality you do must have taken forever. Your efforts are greatly appreciated sir. Thanks greatly Marc! I know where to come back to when I start doing inlay. Awesome video Marc. Thanks for the inspiration. I love your T-shirts too man. Was that afro Bob the painting guy? Thanks Marc for taking the next step and teaching us. I usually pick up tips and techniques by just watching but it sure is nice to have this stuff explained. A pretty neat video and a topic near and dear to my heart. A couple of things to mention–inlay doesn’t have to be restricted to wood, of course. You can inlay shapes cut from mother of pearl, abalone shell, bone, brass or silver, etc. The only difference in the procedure is that the harder materials are customarily cut out with a jeweler’s saw rather than a band saw. And they have to be leveled to the surface with a hard sanding block rather than a scraper. This kind of embellishment was common in the 19th century on jewelry boxes, lap desks, stringed musical instruments, etc. One handy trick is to wrap a small piece of scotch tape around the shaft of the router bit, just above the cutting flutes, leaving a short “tail” of tape sticking out. When the bit spins, the flap of tape acts like a little fan and blows away the wood dust so you can better see what you’re doing. I usually work with a Dremel tool, but I see no reason why it wouldn’t also work with a router. I guess my method with chisels emptying out the holes for the inlay is a bit outdated LOL… I should get some of those tiny router bits, I would probably do it more often. Always wanted to try that and now I shall. Wow, using a nice chunk of bubinga as a scrap “hammering block”! Luv it! Good tutorial. Ever think of using a trim router as an alternative to a full-size unit? Hey Barry. At 22:00 I address that exact question. Especially as a first time inlay attempter, I’d be afraid of ruining my table top. How about doing the inlay on a board that will become part of the top first, keeping at it until successful, then doing the top glue up with the inlaid board? Other than being careful sanding the final, I don’t see a down side. What am I missing? Terrific video. I’m inspired to use those new router bits I just won now! Enjoyed the video immensely! Very inspiring. I was wondering what the total time frame was for that inlay? That seemed like at least a full shop day maybe more, with the glue drying times included. Just curious how long it took you so I can plan to quadruple that to try it myself the first time. Thanks Matt. The whole thing took me about a day and a half, with filming. Obviously the filming slows me down quite a bit. Without it, this would have been a long full day, with lots of hurry up and wait time for the glue. Thanks so much for taking the time to put together the video Marc! This looks so much easier than I thought it would be. Once I’m finished my two current projects (3 in 1 crib/bed for my son and a bathroom vanity) my wife has ordered some new tables for the den/living room. I think I’ll give this a shot! I just had a question pop into my mind regarding the inlay. No not really. A glue joint is so fine it won’t make a whole lot of difference to the inlay. In case no one’s said it….great video! I’d always wondered what method people used to do these types of inlay…thought it was magic or voodoo…who knew? Using the CA glue: it didn’t appear to soak in and change the colour/texture of the wood. I use it sometimes in turning and have seen where the CA was applied after finishing. Do you do anything specific to avoid this, or is it in such a small dose that it’s not a factor? On finishing: have you ever encountered issues with the way the inlay pieces take the finish compared to the workpiece itself (or each other)? Do they ever absorb more/less finish and require touch-ups? I’m thinking along the lines of either very dry woods or maybe very oily woods. The CA glue will soak in and change the color like it does on just about any wood. The key here is that the sawdust soaked up most of it, and I am going to do a good bit of scraping and sanding after the fact. So by the time the top is fully sanded and ready for finish, enough material has been removed and the glue-stained areas are gone. I suppose if you use oily woods in a large inlay, you might have something to be concerned about, but it was never really much of a factor for me. So if your inlay material is oily, you are most likely going to need to treat the entire surface as if it were oily. So a nice coat of shellac would be a good way to seal it off. But generally, the inlay will respond to the finish a little differently, simply because its a different wood with different texture and grain. But ultimately, that’s what adds to the character of the image. So I never have to do any sort of touch up or adjustments to compensate for something in the inlay. Hello Mark…I realize this is an old thread but I just recently tried inlaying. It turned out much better than I thought for my first time. I did have a small crack and used the CA glue…perhaps I need a more precise method of applying it. The CA filled the pores on and around the inlay. I was wondering if anyone else had that problem…and if so…how do you avoid it? The CA glue I used is so thin it spreads like water…and was hard to control. I did wipe it out to avoid puddling…I assume that’s where I went wrong. Also…how difficult is it to inlay in reverse? I have an old box with a missing inlay. Ironically the missing part is a leaf. I planned to use tracing paper and make an outline…then go from there. Thanks! By the way…hot sand is HOT!!! Hey Lynn. You are correct in your assumption. Thin CA glue is messy. In fact, I never even buy the stuff. I only work with medium, thick, and gel. You’ll find it much easier to deal with in thicker formulations. As for going in reverse, I never tried it. It all hinges upon your ability to get an accurate tracing of the original. But don’t be afraid to get close, and then make the new inlay piece just a little bigger than the original. You’ll have to do a little routing to widen the old recess but it will ensure a tight fit. That was by far one of your best video to date.. Not only was the subject matter entertaining and informational your presentation of the material was “Top Notch”. Keep up the great work! Another nice video…The inlay is above my talents at the moment but it is nice to have a reference video to reference to when I need to reference it…Too many ‘references’?? ?…So that is the shaker table the guild was making, looks like a nice project. I am in the middle of a sofa table right now then comes the “honey-do list” of projects, but I may do the shaker table for end tables…anyway, thanks for the video and tips. As always your site is excellent. Any word on the new shop? This one if the best advanced woodworking videos I’ve seen in awhile. Definitely going to inlaying a shot. Thanks for the inspiration! Very nice! The sand shading makes all the difference. Definitely one of your greatest vids, Marc! The sand shading technique is amazing. I couldn’t help but laughing at the Spaceballs reference, glad to see I’m not the only one (still) loving it! Cheers from France, take care! Hey Michael. It was about two days with filming. Nicole’s box looks familiar. Wasn’t it your AAFW show entry four or five years ago? I can’t remember. It was either Nicole’s, or the second version I made for a client. I might have entered it into the competition before shipping it out. Bu honestly I can’t remember. Either way, it’s a very nice looking box and I liked your presentation. Thanks for the blogging. Haha… am I the only one who thought this was a bit “forward”? What really catches me about your final piece are the contrasting colors/woods. It seems like you really have an eye for this – as a novice woodworker, the few projects I’ve built all have some sort of contrasting colors. It’s art (for me)! I’m wondering if you have any tips to offer this direction. I’ve seen a few of the viewer projects that have utilized this; one was an entertainment center, I believe. Do you have to stain/dye woods to get those great contrasts, or does the magic happen in the wood selection itself? Hey Peter. Thanks my friend. I don’t really have many tips for organizing wood colors, but I do have a recommendation. A recent issue of FineWoodworking Magazine had an article on combining colors. Now I don’t agree with everything in there, but you will find some good general do’s and don’ts. As for my wood colors, I rarely use stain or dye. Whenever possible, I try to let the wood speak for itself. So if I want a piece to be darker, I use a darker wood. Just a personal preference. That is really awesome. I love your videos, you make everything look less difficult. I enjoy and look forward to all your videos. Fantastic video. I have only just stumbled upon your website after 6 months of googling wood related stuff here in the UK. The only stuff i have really managed to see is a few series of Norm Abram and a couple of UK shows on discovery channel. I still cannot believe that you give this stuff away for free. It is high quality presentation and your work is up there with the best. I have watched about 10 of your vidcasts now and my broadband connection is smoking getting all the rest of the archive videos. The inlay is one of the best woodworking vids i have seen. While i just do a few bits and bobs from my 8’x10’shed here in the UK, it is learning techniques like this that can allow hobby woodworkers like myself to raise our game and make significant pieces of work. I am currently making a toy chest for my 16 month old daughter and am so excited that i can now turn it in to something with quality detailing and a personal touch, thanks to the information that you give away for free. Your efforts are very much appreciated and your wife does a most excellent job on camera. I am looking forward to your continued success. Oh my god you make it look so easy! I’d love to get into solid wood inlays (I’ve only done epoxy inlays, which can look very nice as well) but this is just out of the ballpark, Love the tips with the sandburning, and I’d definitely like to try this one day. Just need to get over my Router Phobia! This an excellent video. The inlay is very nice. I am a novice at woodworking projects but this looks like something I can do and get a good result. I really appreciate the video. Keep up the good work. Oooh, something else I want to try, kind of a coward to try on a piece, but with enough practice and confidence building I bet I can do it. I might start with using pine or equally cheap wood and get some 1/4″ basswood project wood from a hobby store and work on technique with minimal expense. Thank for the video!! I have a question, can I get by with only a 1/16” bit? I’m interested in doing inlay so thanks for the video!! Sure. But keep in mind that that little tiny bit heats up quickly and its very easy to break. So bigger inlays will not only take a very long time, but you’ll wind up breaking bits. So its always better to hog the stock out with a larger bit first, then use the 1/16″ bit for the detail work. Fantastic video – been trying to watch this for the last 3 days but my broadband was playing up! You mentioned how difficult it can be to use an exacto-knife to score tight curves – one trick I use when setting in during woodcarving is to pick the correct shape carving chisel and press this vertically into the wood – could you do the same when scoring your inlay boundary before routing? Hello from Ohio. I can only repeat what Peggy says on the commercial to Lou Holtz, “you inspire me”. I can now see me trying this inlay because of your detailed and instructive video. I’m going to check if my local Woodcraft has inlay instructional classes. 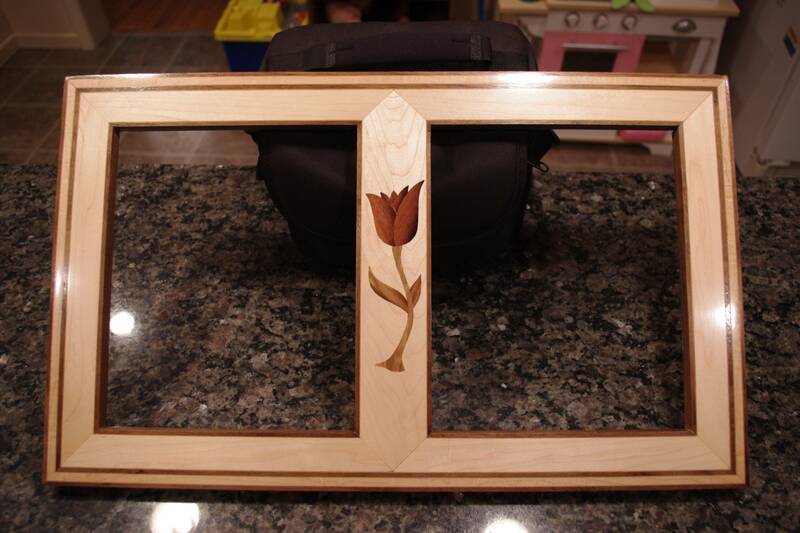 Have you ever thought of doing a scroll saw based “double-bevel marquetry” video? I learned this technique from a David Marks class (Which I HIGHLY reccomend attending) and have enjoyed this technique for my detailed inlay work. I just found your website today looking for ebony plugs. I looked up this video on inlay and was blowen away. Amazing work. Answered so many questions with great detail. Thanks and looking forward to watching rest of your videos and work. Wow, I’ve always wondered how the pros really pull this off, thanks a lot and I can’t wait to try it myself! I was thinking of maybe trying something a little different, though. I’d like to add some more color to the inlays like candy-apple red for flowers and green for leaves and wanted to know how best to pull this off. I was thinking of letting the pieces soak in a container with the stain, so I get a really deep penetration, then makings sure they are fully dry for the burning. Would this affect the wood too much? Any alternatives you’d recommend? Whenever possible, I try to use natural colored wood. Just makes things simpler. So I have experimented much with dye. But the thought of soaking the inlay pieces in dye overnight has occured to be. I just haven’t done it yet to see what woods take the color and how deep it goes. Obviously it needs to go below the surface though since leveling the inlay removes quite a bit of material. All I can recommend is that you experiment. Try a few different dyes and a few different wood species. After the dye soak, let them dry thoroughly. I’d be curious to hear your results. The video is no longer available on Blip. Marc, could you please make it available on your site again? Thank you. I’m not seeing the same issue you are Jack. Works ok on my end. I am in the long-term process of converting all of our embeds to YouTube so I’ll do that on this one. Hopefully that will help resolve whatever issue you’re seeing on your end. You can easily convert all figures to metric with a quick Google search. Google will do the conversion for you in the search box. Pretty handy. Great Video! Do you have plans for the jewelry box? Not yet. Someday I hope to make the box for the website. We’ll have a nice set of plans at that time. Wow – good instructional. I was wondering did you ever have problems where you went outside the line with the router? Is it really as easy and steady as you show it to be? 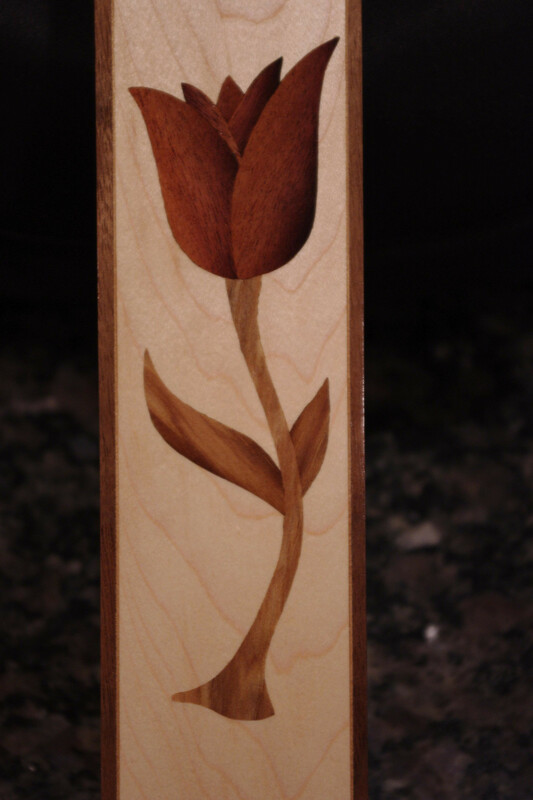 I have to do a flower inlay in an existing table top.. and am thinking about this method. Does it take a lot of practice beforehand? Thanks for the video, I’m thinking of experimenting with some basic inlays in an upcoming project and this was a great introduction. Would there be any benefit in using the clamp to press the inlay into the wood rather than a mallet? Not that I can think of. It might work, but you lose visibility and control. Great video! Nicely done. I really liked the detailed explanation of the technique. It has given me the confidence to give it a try even though I have never done it. Much appreciated. Do you remove the double stick tape from the back of the small pieces before you glue them in place? Oh, goody, the previous comment leads right into mine! I’ve stopped using double stick tape in favor of what 3M calls “Adhesive Transfer Tape” it’s just the sticky stuff and no film so it can be very thin and can be had in various thicknesses. I would think that a thicker one would be better to grip porous wood surfaces better, especially for a permanent application, but I’ve had good results with what I have. The material I use is VHB (Very High Bond) F9460PC and can be had (on Amazon) in various widths, I even have some that is 6″ wide. It goes on just like double stick tape and I’ve used it for posting metal signs at work, woodworking and even for making a large (10 foot wide) cloth kite with no sewn seams. Please note that the this tape MUST be thoroughly burnished or it will come off, raggedly, with the backing. It can also be ironed down instead of burnishing.